Organic Wintergreen Essential Oil (Gaultheria Fragrantissima Wall) - Sweetgrass&Rain Inc.
Wintergreen Essential Oil come from a plant where the principal constituent is Menthyl salicylate. 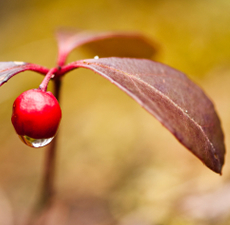 Wintergreen and Sweet Birch Essential Oil are nearly identical in chemical composition and aroma. Both plants were used in traditional folk remedies by the aboriginal peoples of North America. Wintergreen Essential Oil has a characteristic sweet and minty scent similar to Sweet Birch (a main component in the flavour of root beer) with spicy tones.